Welcome to our Promotional Pen Superstore! Get the right Pens at the right price - delivered Australia-wide. Simply click on the images for pricing of pens including logos or message: Australia's best value Branded Pen Supplier. As said, we have the most popular and best value pens in Australia - plastic, metal, pencils, highlighters, stylus, colouring, banner and big brands such as Bic, Parker, Waterman and Styb. 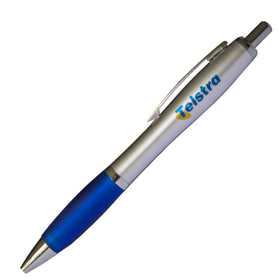 We stock many of these Promotional Pens here in Australia and do not import against your individual order. This very simply means that we can dispatch your order quickly and have these pens in your hands when and where you need them. If you need unprinted pens we can dispatch the same day as your order! printed pens take a little longer: typically 5-10 days after your art approval. ORDER YOURS TODAY. Our staff are ready to help with your enquiry - please call them at any time with your questions - 1300 303 717 - we are here to help! REMEMBER! : we will not be beaten on price. 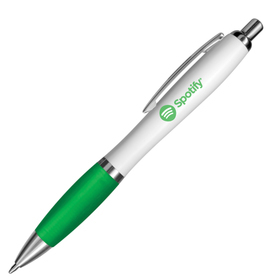 Promotional Pens are categorised, typically, as those which are custom printed with a company or business logo in such a way that the brand name, message or logo is displayed on the item. When you give these out to your clients they will see your logo and name and as such will provide marketing exposure for your company. It is now well established that Promotional Products are an essential part of the marketing mix and have become, increasingly, a factor for business success. If you are a customer it is always nice to see that the companies you do business with appreciate your custom and occasionally reward you with a gift to say thank-you with. There are so many uses of Pens for promotional purposes: as a general giveaway, to give out at trade shows, for conferences, for students, as a gift for loyalty...the list goes on and on. Whatever your reason for giving them you know that your client is going to use them and therefore be exposed to your logo and message on a frequent basis. Pen Guide - Parker, Waterman, Promotional and more! Plastic: Our best value, lowest cost pens - cheap options that still perform the job required - writing and promotion of your brand. Dispatched in 2 weeks or less. Premium Plastic: As the category name suggests this is where you go when you want a plastic pen that is just a little better than the rest. Dispatched in 2 weeks or less. 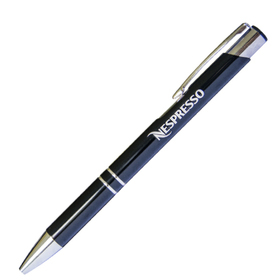 Metal Pens: Metal Promotional Pens now cost less than you think! We are home to Australia's lowest cost options - all can be engraved or printed - you choose. Dispatched in 2 weeks or less. Highlighters: Highlighters make for a great way to market your business or organisation. Costing less than you think we have standard colours- pink, orange, yellow and green. Dispatched in 2 weeks or less. Stylus Pens: One of the fastest growing pen categories are stylus pens - synching in with tablets and smart phones they combine the needs of old and young alike! Dispatched in 2 weeks or less. Colouring and Crayons Our range is not just for big kids but little ones too! 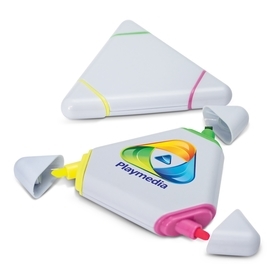 We offer a range of crayons and colouring pencils for promotional flexibility. Dispatched in 2 weeks or less. Banner: When you want a pen with just a little more our banner options give you full colour printing on a large area - great value and cheaper than you think! Dispatched in 2 weeks or less. Novelty: When you want to inject some fun into your promo or need a different angle to approach your promotion from a fun and quirky writing instrument can be the way to go! Dispatched in 2 weeks or less. Bic Plastic: The legendary supplier makes pens of excellent quality and value. These Bic Plastic Pens will write further giving your promo extra legs. Dispatched in 2 weeks or less. 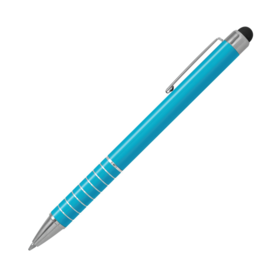 Bic Metal: Bic Metal Pens can be either printed or engraved - you choose - do you need colour or do you need subtle understatement? These will last for years. Dispatched in 2 weeks or less. Parker: Parker is one of our favourite pen styles and you will see from reviews that this favouritism is based on good reason. Replacement ink cartridges will make your promo last longer! Dispatched in 2 weeks or less. Paper Mate: Another giant of the pen world PaperMate Pens are great when you want your marketing to be backed up with brand name recognition and trust. Dispatched in 2 weeks or less. Cross: When you are looking for a gift pen look no further than our Cross Pens - superlative quality and design and reeking of style this option is for the discerning buyer. Dispatched in 2 weeks or less. Styb: From Spain the Styb pen range will last the distance. European design and manufacture combine to give you a nice looking option. Dispatched in 2 weeks or less. Sheaffer: The upmarket sister brand of Bic Sheaffer make only premium metal pens. Printed or engraved - the choice is yours - get yours today! Dispatched in 2 weeks or less. Waterman: We like Waterman Pens and when you want to give a valued client or staff member something valuable these are the way to go. Dispatched in 2 weeks or less. Very briefly: all of the Promotional Writing Pens you see here can be printed. Not only can you have a single colour print (which most are costed with you can elect to have multi-colour prints - just ask for a quote. Alternatively on metal pens you can have the option of a logo engraving - this is a more subtle finish for when an upmarket finish is required. Our staff are ready and waiting for your enquiry - please call us on 1 300 303 717 at anytime to get your order underway.